SP-1 and SP-2 brakes are, respectively, essentially the same as 929 and 954 (in terms of calipers and MCs), the only major difference is the use of 320mm rotors on the RC compared to 330mm rotors on the CBRs. YOu can't go wrong with any of the combinations. OK so here is something I didn't see, what's the spacing for the rotor on each? My thought process is I'd prefer to keep the stock VTR wheel so they match fr-rr. I would think the axle issue should be solvable with different bearings. But are the rotor spacings different that would negate this? Also are the rotor bolt patterns different where they woudn't be interchangable? I wouldn't think it'd be to hard to put a shim behind the rotor to space them further apart if needed. Though if they are closer together on the RC or CBR that may be an issue. So y'all think $250 for both forks, upper and lower tripple clamps and the axle of an '00 929 is a good buy? What's the difference between the calipers on the SH vs the 929? I wanted to add that the Second Gen Hayabusa forks will bolt right up to the VTR's frame. The only thing that I really had to make "custom" was all ***** bearings for both the top and bottom half of the triple tree. They are also 50 mm forks and are considerably (and understandably) larger than the VTR's 41mm. I had to utilize the second gen busa wheel and rotors as well. The turn lock is also wider so it will hit against the top radiator hose but if you read the thread, you would know exactly how to fix that (if you felt froggy enough to). I didn't need to get any kind of custom brake lines or clutch lines because the busa forks (mine did anyway) came with the brake lines intact and in good working order. The clutch line is just long enough to reach the clutch master cylinder so I was able to use the busa's clutch and brake cylinders. Hope this helps anyone out there who is thinking about this swap. Pictures of the front end can be seen from the link in my sig. At a shop I was working at about a year and a half ago we had a guy set up his sh with a gsx-r 1000 front end, with woodcraft clip ons, sh front wheel. The rest was all gsx-r1000 components. The only issue was you needed spacers for the caliper so it set right with the rotor. (not sure what year the liter front end came off) There may be more to the build that I didn't see but that's to the best of my knowledge all the components. They are also 50 mm forks and are considerably (and understandably) larger than the VTR's 41mm. 50mm outer tubes, 43mm sliders. I think you are both right. I am in the middle of an SV650S front end swap. 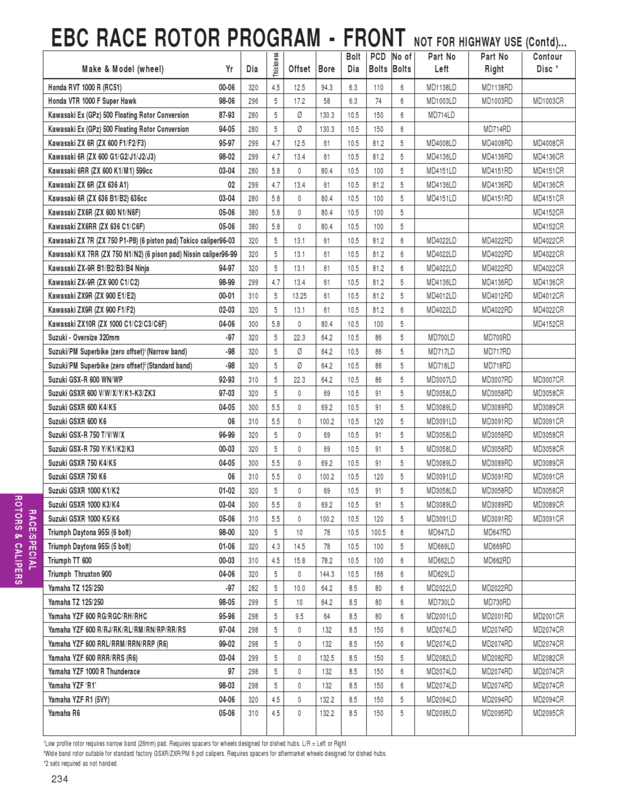 The SVRider forum guys have an extensive chart for Suzuki front ends that may be of use for VTR owners wanting measurements and interchangeability of GSXR and BUSA front end parts, wheels, rotors. Something that I see often overlooked is that before a fork swap is the replacement forks often need springs and a revalve. This is certainly the case with Hayabusa forks. The internal valving is crap and the springs are on the soft side for many riders. Please don't get fooled into thinking straight out of the box the inverted forks will be better. Sure, they are probably better than the stock VTR forks. In most cases doing springs and revalve on your VTR forks will net you better performance than a set of stock inverted forks. So for someone who rides about 600 miles a year and not extreemly agressive, youre saying reworking stock forks will suffice? im 205 at 5'11'' and my current forks bottom out extreemly easy. its a 98 model and i dont know if previouse owners ever serviced them. Yeah, for most riders a revalve/spring upgrade is plenty. USD forks are nice but I'm not sure the average rider would be able to justify the cost. I am working on a fork swap using 04/05 ZX10r forks & calipers, 07 CBR600rr triples and a GSXR1000 radial mastercylinder. This puts the brake caliper centres at 132mm, and the 04/05 ZX10r axle is the same diameter as the VTR's. 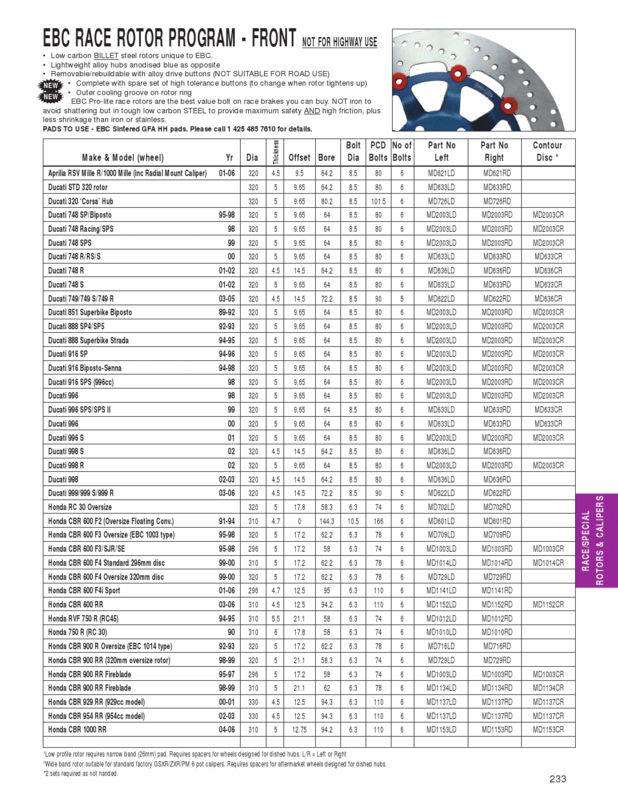 VTR brake disc centres are at 130mm, which is ok. Floating piston calipers allow for such discrepancies. With this setup I can use the stock wheel. I'm working on spacer sizes now. The top triple had to be bored out to 50mm, bottom was fine. Bearings and spindle were the same. I will have to adjust the steering stops as they don't allow enough lock, and then I will need to put the radiator spacers on. With the downward gullarm top triple the forks are long enough. The brakes on that model of ZX10r were known to be soggy, and that mastercylinder is a known fix on the zx forum. So the fitment holes are same spacing on the SP-1 discs(rotors) as the 954? Bolt spacing is the same across many models and years. Take a look at these charts. Has anyone ever determined which of the fork swaps is the lightest? I am running 2005 ZX-10R forks and had read at the time of their release that they were the lightest USD forks around. That may or may not be the case anymore.